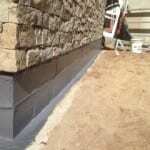 TPC have added a TERMSEAL termite barrier under a slate wall on a Gold Coast property this week. The photo shows the finished result. Another homeowner safe from termite attack and destruction.